This post was written by Nell, aged 16, the winning entry in our Children’s Writing Competition.. 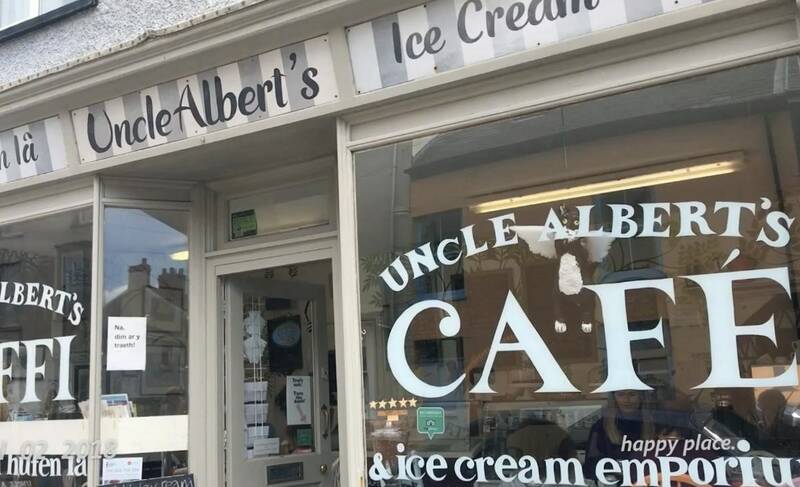 Along the street of a small seaside town stands a building that blends perfectly with the blue sky above.“Uncle Albert’s Ice Cream Emporium” boasts the best vegetarian breakfasts in Borth, endless sausages and golden hash browns wait patiently to be consumed. Creamy coffees and steaming hot chocolates are on tap, served, if desired, with a slab of vegan “cherry berry” cake . To dine alongside walls teeming with trees and soaring birds painted by illustrator and owner Gabrielle Adamson, (fans of Topsy and Tim may know of author Jean Adamson, Gabrielle’s Mum), is the perfect way to start the day. Across the road lies beach and open sea. Unassuming wooden stumps cluster the sand, but of course one wouldn’t know that they’re the remainder of trees submerged over 5,000 years ago- an ancient forest lying dead at feet. Although small, the town of Borth is home to a host of diversity. Its layout is gorgeously simple; a row of charming houses line the edge of the beach, the Main Street behind (just the one), stretching across Borth like an open smile. Tumbling fields are the view from every rickety window, and train tracks slice through mountainous domes. Purchase a little orange ticket, cheap as chips, and suddenly Wales is at your fingertips, the railway stretching like veins to every corner of the country. First stop is Criccieth, chosen today to be explored by car. Home to the first “Cadwallader’s” ice cream store (seems to be a bit of a recurring theme! ), Criccieth Castle and impressive pebbly shores. As my ancestors lived for a while in and around Criccieth, it’s a special place for me, but anyone that visits can recognise it as a lovely, quirky town, pastel coloured houses dotted randomly between expansive beach and fields. The castle, built in the 13th Century, protrudes proudly into the air, and watches over the town- the guardian of the land. Exploring history can be tiring work, so come lunchtime and the local fish and chip shops will seem inviting, salty smells of vinegar and battered cod wafting through the streets. Stomach full, there are plenty of curious antique stores go be investigated, perhaps a hidden gem amongst the aging mahogany waiting to be found. Leave Criccieth and drive down a quiet country lane, framed by leafy trees that reach and stretch to stroke the roof of the trundling car, for a small, extraordinary village awaits. Acquired by Welsh architect Clough-William Ellis in 1925, it took around 50 years to build and perfect this treasure. Passes ranging from £8.50 – £12 will allow you to wander around the Italian-esque village, marveling, mouth wide with wonder. 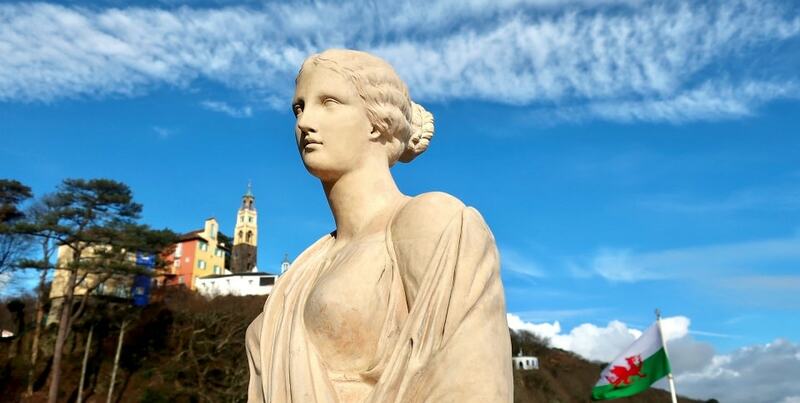 It’s clusters of houses, cafes, pottery and souvenirs shops have all been designed to resemble Palladian architecture, painted gorgeous shades of blue, pink and orange. Ignore the rippling Welsh flag and suddenly, somehow, you’ve been transported to a Mediterranean sunlit paradise, complete with palm trees, an impressive piazza and bright colours bursting, radiating from every crevice. 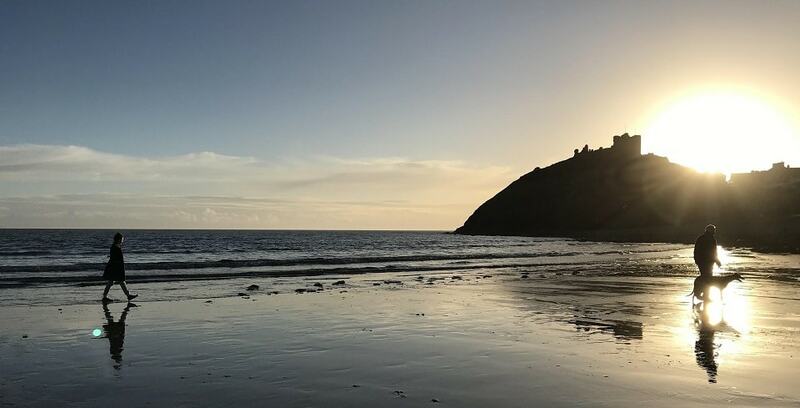 Venture past this artificial grandeur and you’ll be met again by a breath-taking sight, this time completely natural, as the village is surrounded by some of the best sights of rural Wales, at the edge of Dwyryd Estuary. Nearby cafes offer oozy cream teas, or some tempt Italian-inspired dishes for those who choose to play along with the lucid magic of the village. 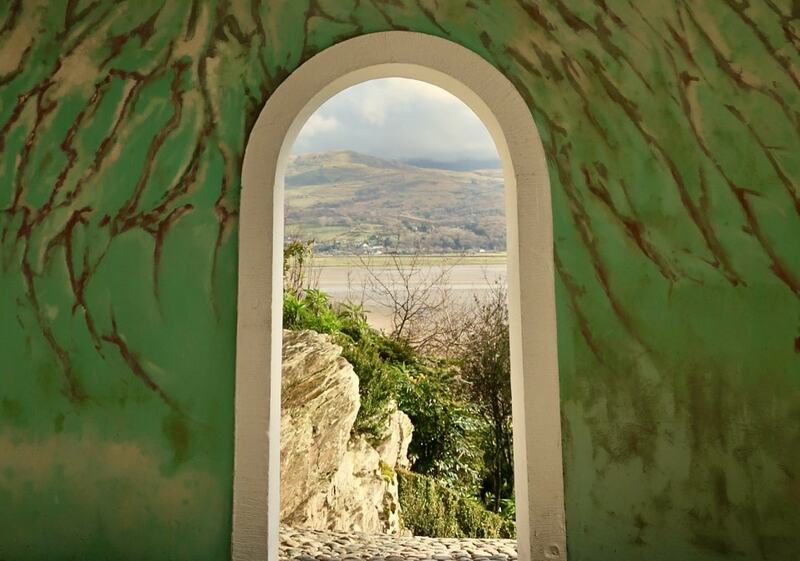 If you can finally summon the will to exit the gates of Portmeirion, you may find you have front-row seats of the spectacular scenes beyond. Both rail and road offer views of rolling hills, sea glittering and sheer cliff faces dipping. Drive for hours through the Welsh countryside and you’ll find that you’ll be unable to tear you gaze from that nearby window, unable to resist gobbling up the sumptuous sights of rural Wales. Heading South, as the skies begin to dim, the historic town of Aberystwyth comes into view. Heavily populated with university students, hipster cafes and quaint seaside shops, “Aber” is known to be one of the most sought-after holiday venues in West Wales. Park along the Victorian and Edwardian building-studded promenade and, if you’re lucky, you may witness a marvel. 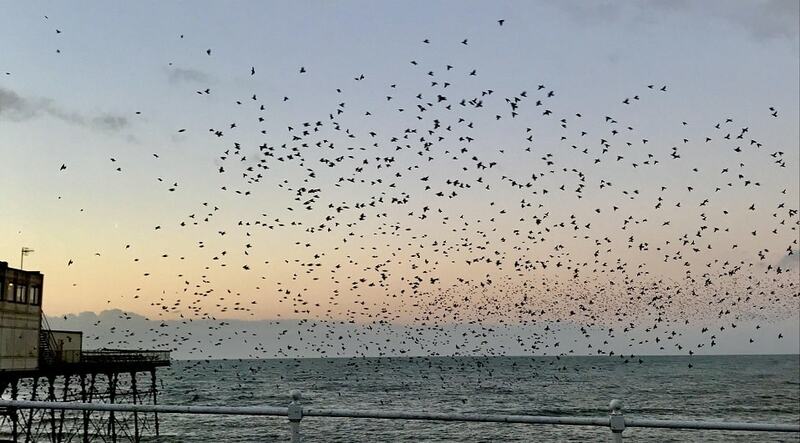 Every year, typically in Autumn, thousands of starlings return to the UK, and the pier in Aberystwyth is a well-known roosting spot. Shoals of starlings storm the skies, gracing astonished onlookers with their displays that have come to be known by the name of “murmurations”. It’s a true phenomenon to simply tilt back your head and watch, the sky swarming, each starling flicking from cloud to cloud and eventually coming to settle underneath the rickety wooden structure, unperturbed by waves vigorous below. 10 minutes more of winding lanes and we return to where we began, in the now not-so-sleepy village of Borth. Pubs host hoards of locals and visitors, all eager to make the most of the evening. Dinner eaten on the beach (potentially accompanied by snug blankets, gloves and scarves), is also highly recommended, and if you time it just right, you’ll see the sun splatter the sky orange and turn the world pink. Soon after it’ll get dark fast, so retreat to Uncle Albert’s Emporium for the final show, the grande finale. 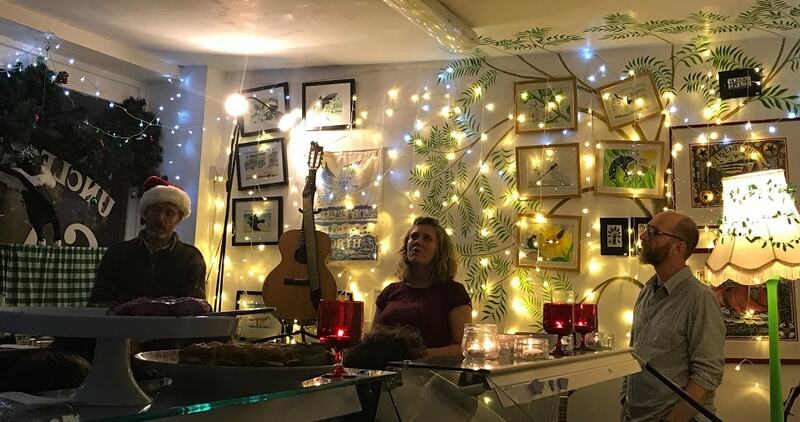 Tonight the “Three Legg’d Mare” are performing, an acclaimed folk band that will be sure to have your smile stretching, foot stomping and hands rapturous with applause.